All are welcome. NO EXPERIENCE NEEDED! Sensitively facilitated with minimal instruction for flow & interesting dynamics. Supports awareness, creativity, connection & self-care. Karin is a percussionist, drumming instructor & rhythm circle facilitator. She has been teaching upbeat workshops and percussion lessons since 2006. From school students to seniors, boardrooms to beaches, Karin creates a heart-centred and accessible space for people of all skill levels and ability. Karin’s teaching style is fun, inspiring and beginner friendly. 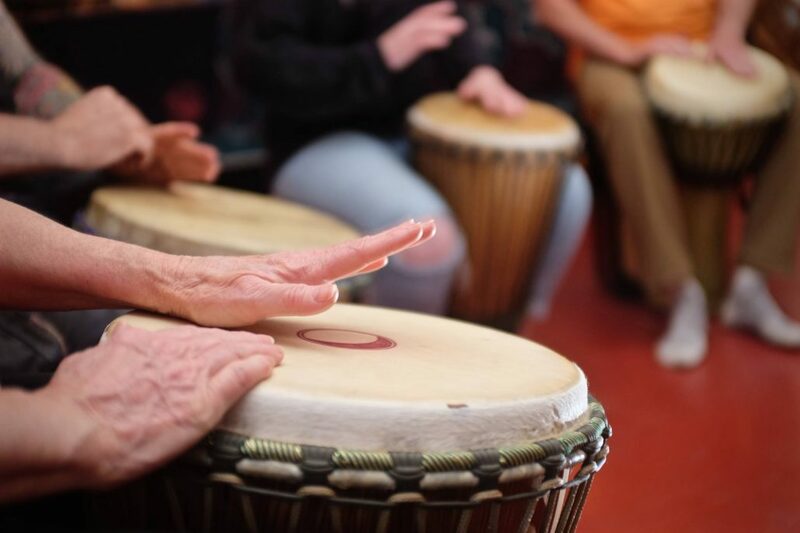 Through rhythmic embodiment, deep listening and creative empowerment, participants quickly find themselves drumming and energized by a sense of joyful unity. Being in rhythm together fosters connection and awakens the rhythmic quality of our human nature. Karin is passionate about honouring each individual as an equally valuable part of the whole and creating an atmosphere where everyone feels authentically supported by one another. Karin is a mother and volunteer counsellor at Cowichan Family Life. She also runs an eco-friendly domestic care business. She is currently studying the rhythmic nature of the human body and energy field through Biodynamic Craniosacral Therapy. She loves exploring forests and beaches and making nature mandalas.